A major exhibition of over 110 works by this brilliant american artist was held at Palazzo Reale. They came from public and private, american, european and asian collections, many were extremely large, some have never been exhibited before or never been shown in italy. This show rended the full significance and complexity of Keith Haring’s research for the first time, by highlighting its relationship with art history. The exhibition layout established a dialogue between Haring’s works and his sources of inspiration, from the archaeology of classical antiquity, to Pre-Columbian art, archetypal religious figures, Pacific masks and the creative art of indigenous Americans, right up to 20th-century masters such as Pollock, Dubuffet and Klee. 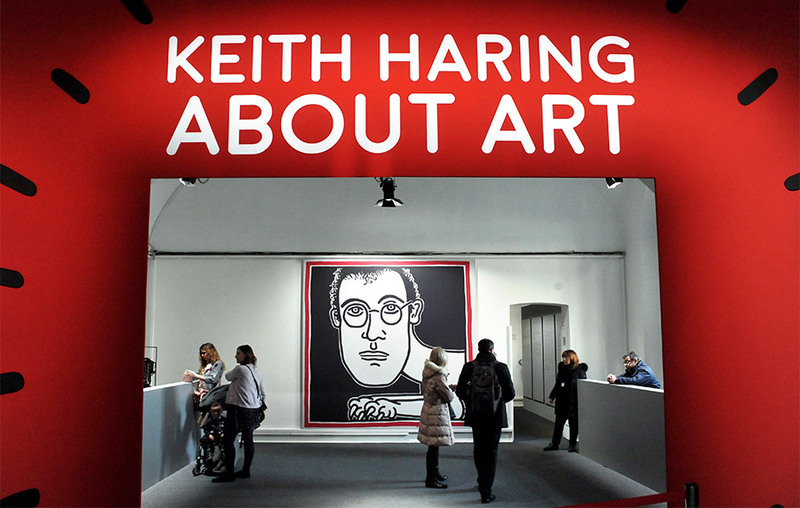 Curated by Gianni Mercurio, promoted and produced by the Comune di Milano – Cultura, Palazzo Reale, Giunti Arte Mostre Musei and 24 ORE Cultura – Gruppo 24 ORE, with the scientific support of MADEINART, and with the valuable contribution of the Keith Haring Foundation, the exhibition ‘Keith Haring. About Art’ featured over 110 works, many of which were extremely large, some have never been exhibited before or never been shown in Italy. This show pivoted on a new critical approach: an interpretation of Haring’s oeuvre is not correct if it is not also seen in the light of art history, which he understood and placed at the centre of his work, assimilating it to such a degree that he explicitly integrated it into his paintings, so that this became the most significant element in his aesthetic research. 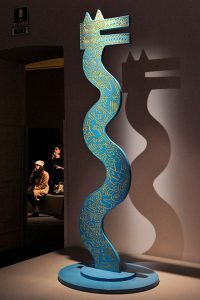 “Keith Haring’s unmistakeable language sets the pace in an exhibition with an incredible iconic, visionary force”, commented Milan’s Alderman for Culture Filippo Del Corno. “The exhibition explores a new critical approach, for the first time comparing Haring’s paintings and graffiti and the videos of his performances to works that furnished the creative stimuli for his personal imagery, which he drew from classical, tribal and pre-Columbian traditions, from the Renaissance and right up to twentieth-century art”. some of his last experiments. The show featured 20th-century works by Jackson Pollock, Jean Dubuffet and Paul Klee, but also plaster casts of the bas-reliefs on Trajan’s Column, Pacific masks, Italian Renaissance paintings and so on. Keith Haring was one of the most outstanding artists in the second half of the 20th century. His art is seen as the expression of a socially and politically committed counterculture and deals with issues of his time and ours: drugs, racism, Aids, the nuclear threat, youth alienation, minority discrimination and the arrogance of power. Haring participated in a collective experience and became the icon of the global artist-activist. However, his project, as this exhibition made clear, was to bring the languages of art together in a single, personal, symbolic imagery that was also universal, to rediscover art as the testimony of an inner truth, whose focus is man and his social and individual condition. It is here that Haring’s true greatness lies, it is from this that his celebrated commitment as an artist-activist sprang and developed, and it is this that strongly distinguishes him from his contemporaries. The layout of the exhibition was stimulating and also full of references to the context in which Haring’s short explosive life enabled him to express himself as one of the leading personalities of postwar American art. The catalogue, published by GAmm Giunti/24 ORE Cultura, includes a long illustrated biography as well as reproductions of all the works in the exhibition and texts by the curator, Gianni Mercurio, Demetrio Paparoni, Marina Mattei and others.